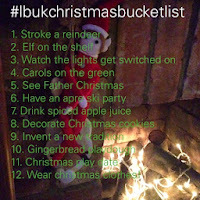 I am aware that we hardly even touched on our autumn bucket list, but here's our Christmas one anyway, I'll try and get motivated to write about not achieving our Autumn one soon! This is something that we do, do every year without even knowing it, most of these are traditions we've been doing forever, whilst some are new things I've thrown in for this year. This one has not been family decision, so we may find more gets added when I talk to the kids but this is a good starting point. Some items on here have either been done or are already planned!! Love that I'm so much more organised at Christmas because I have very limited time in which to do such things! We have The Teens for longer this year so I'm hoping we can organise a few more family things for then, I'm sure a big Christmas jigsaw will come out for us all to join in with, they'll be our Christmas box opening on 20th (Christmas Eve box but we do ours with The Teens not Christmas Eve) and our Boxing Day on 27th where we celebrate Christmas all over again with The Teens! 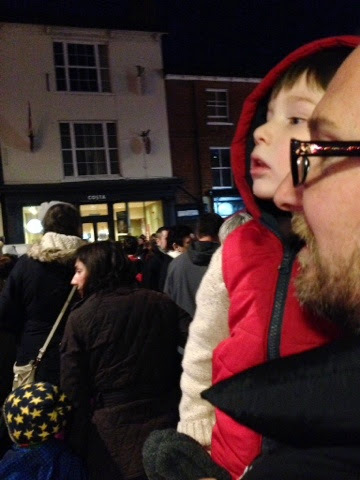 (3) Last weekend we went to watch the lights get switched on at Newport Pagnell. It's the 4th time we've done this, the first time I was expecting T but since then he's come too, it actually was the first time that we've done this with The Teens. (2) Our elf Buddy arrived as you can see, he's been getting up to lots and I'll be posting a round-up of his first week with us on Sunday, so look out for that if you are interested in elf antics. 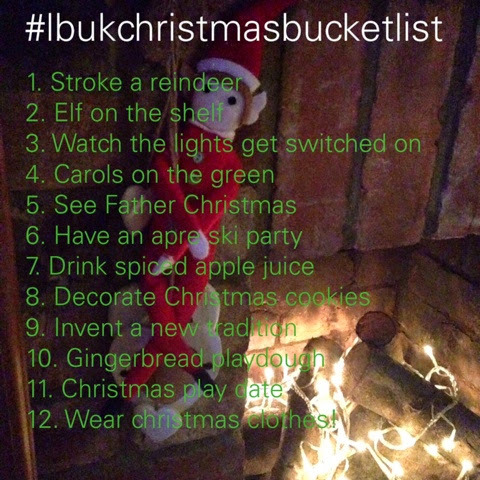 I'm so glad we are doing this, I'm definitely an elf lover! (12) T and I have already been rocking our Christmas gear, we've both worn Christmas socks and pants all week! The Hubs moaned tonight that he doesn't have any so I'm off to get him some on Monday, he's also seen a new Christmas jumper he likes so he's off to get that. I still need to get a Christmas jumper for me and The Teens I might make do with some T-shirts instead! (1) Tomorrow we are off to see the reindeer so hopefully we can report back that we've stroked one or two! (11) Sunday, we are hosting one of our famous (within the family!) play dates, Jack and Molly are coming over for a few hours of Christmassy fun! (9) We're hosting a family day on New Year's Day, something that we hope will become a new tradition, I plan to serve (7) mulled or spiced apple juice so going to be working on a recipe for that in the coming weeks.